Tampa, FL, police are praising a handful of people who rushed to the aid of an officer as he was engaged in physical combat with an 18-year-old burglary suspect, reports WTVT. Officer Michael Collins was responding to a disturbance call Wednesday afternoon at an Econo Lodge when he met Luis Manual Vila, 18, of Tampa. TPD says Vila matched the description given for a young man who had taken a manager's key ring and was wandering through the hotel. Officer Collins tried to detain Vila, and a scuffle ensued. The officer also tried to deploy his TASER, but TPD says it had "little effect on the suspect," who also managed to hit Officer Collins. The two fell to the ground during the altercation and Vila reportedly kept hitting Officer Collins. As the two struggled on the side of Himes Ave., cab driver Ray Freeman saw what was happening and ran to the officer's aid. As the situation began to draw more attention, a delivery woman, Dolores Lyle also ran to help the officer. 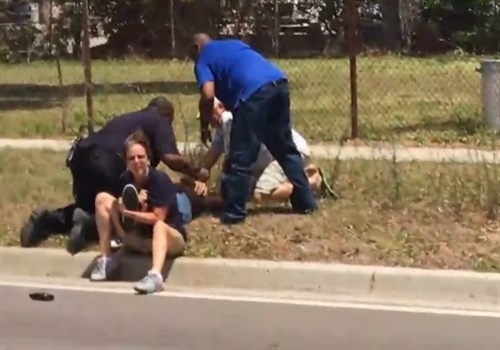 She grabbed the suspect's feet to keep him from standing up, then sat on his legs. As Freeman and Lyle helped restrain him, Officer Collins was able to secure handcuffs on Vila and, within minutes, a second officer arrived to back him up. By this time, other citizens had gathered to help and the situation was under control.